The Kings have always been a tough matchup for the Avalanche. That continued this Monday evening at Staples Center. 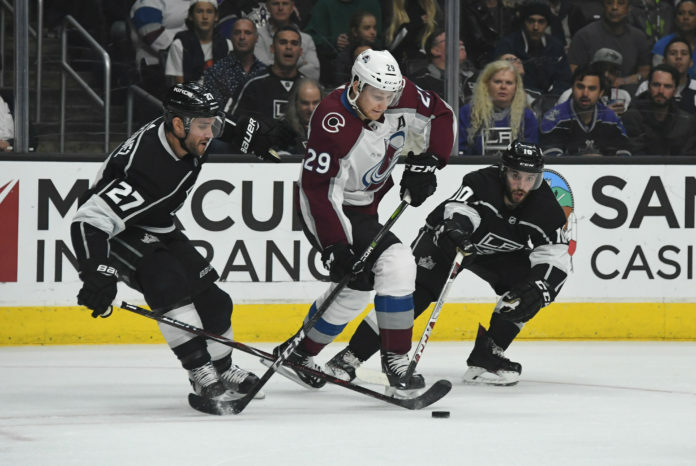 Los Angeles got off to an early two-goal lead and stifled the Avalanche offense the rest of the night, minimizing chances at even strength and coming out with a 3-1 victory. The top line of Nathan MacKinnon, Mikko Rantanen, and Gabriel Landeskog were held off the scoresheet again, and have struggled at even strength over the last two weeks. The Avalanche continue to hold the final playoff spot but will need at least one victory in the final two games. Jonathan Bernier, playing the second half of the back-to-back, struggled in the first and it hurt the Avalanche. Bernier pushed a soft shot by Nate Thompson aside that bounced off the boards and went back out in front of the net for Torrey Mitchell to bury and give the Kings an early lead. Just a few minutes later, the Avalanche would get a power play, but Dustin Brown found himself one-on-one with Tyson Barrie and used Barrie as a screen and floated a shot through his legs and over Bernier’s shoulder to give the Kings a two-goal lead. The Avalanche would not create much offense the rest of the period, and the only real spark would come from Nikita Zadorov fighting Dion Phaneuf after Phaneuf leveled Mikko Rantanen. The Avalanche would come out much better in the second period, creating a little bit more offense. While they would find themselves unable to solve Jonathan Quick at even strength, a drawn penalty by Samuel Girard would give the Avs their third power play of the game, and they finally took advantage. Sven Andrighetto made a terrific cross-icee pass to find a wide open Alexander Kerfoot, who waited out Quick and beat him over the glove to cut the lead to one. The Avs would get more chances in the second, mainly coming from the Kerfoot line, but would head into the third down a goal. The third period started with the Avs defensive depth coming back to haunt them. David Warsofsky — who was only playing because of the injury to Erik Johnson — made a bad read, leading to an odd-man rush the other way, and Kyle Clifford took a rebound and wrapped it around Bernier to restore the Kings two-goal lead. From that point on, the Kings would suffocate the Avs offense, allowing very little and making life miserable for the Avs top line. The Avalanche would pull the goalie with three minutes left, but create only one shot on net, and left the Staples Center empty handed by a score of 3-1. The Avalanche now get a few days off before they head to San Jose to take on the Sharks Thursday. They will be watching the scoreboard on Wednesday night when the Chicago Blackhawks take on the St. Louis Blues. The Blues have a game in hand on the Avalanche, and are only one point back. The Avalanche may have found a second line heading into next year, as Tyson Jost, Alexander Kerfoot, and Sven Andrighetto are picking up the pace offensively. They were easily the teams best line this evening. This may have been the best game in an Avalanche uniform for Samuel Girard, who did not look intimidated by a physical Kings team. Nathan MacKinnon has now gone eight games without a goal. Other teams are focusing on him, and Anze Kopitar eliminated him from the game Monday night. Colin Wilson returned to the lineup tonight, but did not look like a guy who would be playing if this was January. He looked slow and out of place, although he did pick up an assist on the only goal. It appears the Avs and Blues are on a collision course to play a “winner gets in” game on Saturday evening at the Pepsi Center. Both teams are slumping at the worst time, but one of them will make the playoffs.